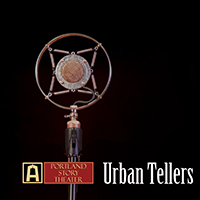 Everyone who participates in Urban Tellers has taken our workshop, The Art of Personal Narrative. These are people from our urban community —- people just like you —- who have worked to discover and craft their stories. Urban tellers stand alone on stage, fueled by the POWER OF THEIR STORIES and the ENERGY OF THE AUDIENCE. Together, tellers and listeners, embark on a shared experience that is a potent blend of vulnerability and heart. Exhilarating. Energizing. Empowering. $18 after 5 PM and at the door at 7 PM. Present your Oregon Trail Card at the door. Portland Story Theater participates in the Arts for All PDX program, which allows holders of the Oregon Trail Card to buy tickets for a reduced price of $5 each. To take advantage of this discount pricing, after selecting your first performance date, just click Continue Shopping to choose different dates.